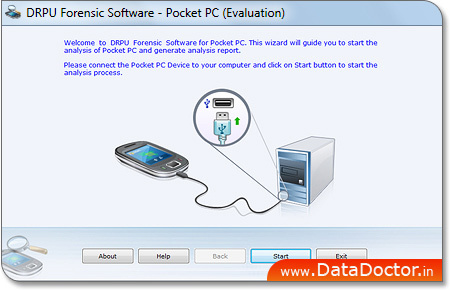 Pocket PC forensic software extracts all detailed information of windows based mobile devices. PC forensic utility is used to collect data from all PDA or equivalent digital devices for forensic analysis and scientific investigation. Smart phones investigator utility is fully capable to capture detailed information of mobile phones such as windows registry records, database records, mobile processor architecture and other related information of cell phone devices. Cell phone examiner software is helpful to examine the other relevant information of cellular phone including SMS, call history, last dialed and received number and saved files/folders history. Pocket PC data extraction application provides mobile phone information including model number with manufacturer name, SIM IMSI number, mobile IMEI number, battery status and signal quality. » Extract all detailed information of Windows based pocket PC or PDA mobile phone device such as OS registry records, database records, all saved files and folder information. » Examine the information about saved text messages, call history, mobile model number with manufacturer name, IMEI number, sim IMSI number, battery status and signal quality. » Facilitate to generate text report of extracted cell phone information for further use. » Useful for scientific investigation and forensic use.